PES Goal keepers are funny people. One moment they bring you joy, and the next moment, they bring you sorrow… by doing the same thing – Commiting Howlers! The difference between joy and sorrow is the colour of their jerseys. Just hope that he is on the other team. Before we go on, lets take a look at 2 of them. 1. Julio Cesar. Inter And Brazil 1st Choice Keeper. He catches a long ball, almost brought it into his own net, drops the ball, and rushes to pounce on it. Phew. Next up, we have.. Victor Valdes! He approaches a long ball and does a sliding tackle for no reason, missing the ball and the player completely. And Ronaldinho has the simplest of tasks to tap the ball in. Sigh. Since such blunders can even happen to top keepers, there is not much hope for the rest I will say. Our players tend to commit mistakes, one after another, when they are under pressure. Keepers are no exception. Thus when you find that momentum is not on your side, and your players are not their usual self, you have to keep the ball in your opponent’s half. Pump the ball up the field and keep it there. Playing the ball at the back will often result in mistakes such as losing possession to opposition strikers, and keepers will not be able to save you with their erractic self during this period of time. 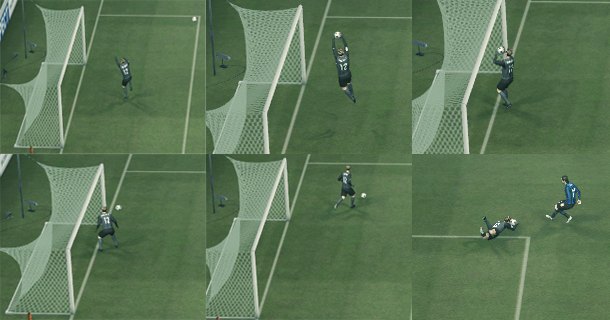 you have mentioned the fatal ERROR committed in this case by Victor Valdes, I reckon that PES 11 should fix this out because since PES 2005 this ERROR has ever happened. Haha you noticed it since PES 2005? Looks like the developers are not doing their job well enough! I have encountered several other goal keeper bugs but this is the first time i notice the Victor Valdes error, although I read about it occuring before. 5 years since PES 2005! and this has not been fixed. Do you think they even know this bug exists? Lol. These errors haven’t even been fixed in PES 2011, well for me I encountered a typical occasion. V.Valdes failed to capture a ball from like the center line by Khedira in the UEFA champions league final in my master league! I was like what on earth? :S He just punched it into the right side of the goal post and it bounced back in. Sigh, what a pain after all that hard work to the finals. Immediately I put him on the transfer list, I was so pissed off. Lol. Bought this young keeped called Perin, he made Valdes’s overall, yet he’s only more than 5 years younger than Valdes! Oh thats disappointing. Thanks for pointing that out! So far the situation is fine for me, however judging from your comment i would guess this issue still exist! Still, lets hope that it doesn’t happen too often as before haha!